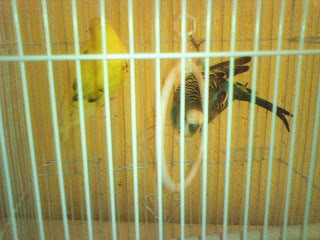 Yes I bought 2 parakeets Saturday at the Fair on the Square. I'm sure the rest of my small town did to. These are my new little friends. Bob & Lulu. 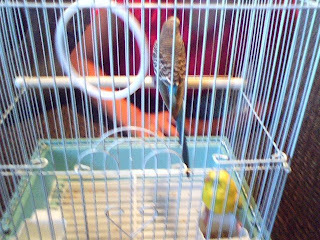 Bob was orginally the yellow one's name bacause he's yellow & my nephew loves spongebob, but then we found out bob was a girl lol. So now her name is Lulu & the blue one is Bob. I had a green one when I was little, his name was BB. yea, I was soo creative naming him...I loved that bird!